Hi everyone. Here’s good news for you! The update of clothes for the spring and summer from Romwe has been launched comprehensively and extensively! They haven’t push-off any new products since last December so now, they will launch dozens of new leggings every week from now on. 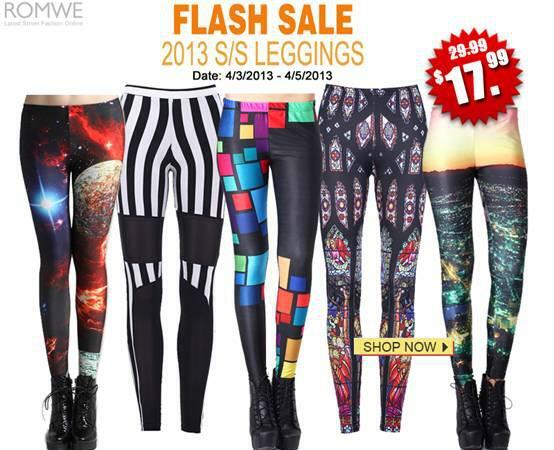 Now, they sale the leggings at a price $17.99 while they were around $30! That is the $17.99 Leggings Flash Sale! Plus Free shipping! They only give this for 72 hours so hurry up and tell your friends! Also, I'm giving away coupon code that you can use for discounts on your transactions. 10% off $50 + at Romwe.com, 10% off any orders over $50 Free shipping! Ends on 4/15/2013. 15% off $80 + at Romwe.com, 15% off any orders over $80 Free shipping! Ends on 4/15/2013. 20% off $110 + at Romwe.com, 20% off any orders over $110 Free shipping! Ends on 4/15/2013. I guess this is for the younger age group!